On being published and being sacked: My crazy roller-coaster fortnight. On 28th August 2014, my first novel was published. Even now, I can scarcely believe that I can type that, or rather, I can scarcely believe that when I type it, it’s not a lie. But it is so. In fact, there is only going to be one lie in this post, and one mild inaccuracy. And I’ll point them out when they come, so you aren’t left wondering. So, my novel was published, and I was very excited and did all the new-writer things that you have to do, like going into W H Smiths and pretending I’d heard of this great new book and asking if they could order it, and slightly mispronouncing my own name so they wouldn’t suspect it was my book. And signing a copy for my sister-in-law with a great big flourish only after spending ten minutes choosing my most authorly pen. You can’t earn a living from writing novels. Well, you can if you’re one of those people, the JKRs and the Stephen Kings and whatnot. But most writers who publish a novel go back to work, once they’ve finished fake-ordering copies of the novel. People don’t want to hear this. They think once you have published a novel you are automatically rich and successful. They don’t want to know that: 1. Your advance for two books is less than a year’s national average wage. 2. Your agent gets 15%, so your advance is now much less than one year’s national average wage. 3. You are paid your advance in four instalments and so far you’ve had only one, which you spent on a new carpet for the stairs because the old one was an accident waiting to happen. So I went back to work. I was glad to. I liked it. I worked for my local town magazine and it was a fun job. I’d been there for six years – the first three as a columnist, the second three as the deputy editor. We had recently been taken over by a new owner, and to cut out the boring detail in the middle, on 22nd September he called me into his office and sacked me. Well, there’s the lie and the inaccuracy I promised you. The inaccuracy: I couldn’t really be sacked because I was a freelancer, even though I was a freelancer of six years’ standing. So I was simply told to leave, that my services were no longer required. It was like that moment on The Apprentice when Alan Sugar’s stubby finger of doom points at the candidate and they have to get their wheely bag and go. Except for these differences: I’d been there six years, not six weeks; I didn’t get the chance to try and convince him otherwise in a heartfelt speech that invoked ponies and my youth as a cheeky-chappie market trader; I didn’t go on to a C-List TV career; I wasn’t wearing high heels; Nick and Karren didn’t smile sympathetically at me as I staggered out; I don’t have a wheely bag. The lie is in the title. It wasn’t a crazy rollercoaster fortnight – it was just over three weeks. Twenty-five days, from 28th August to 22nd September. But fortnight sounds better. People who knew what had happened were really wonderful and supportive and kind. People who didn’t know assumed I’d left my job because I was now a rich and successful novelist. But see paragraph 3, above. Anyway, I cleared my desk and went home. Every so often, I’d forget about the sacking, and remember my novel, and smile. Then I’d forget the novel, and remember the sacking, and cry. My second novel comes out this September. I am wondering what its accompanying shattering life event will be. Diagnosis of a terminal illness? A house flood? Divorce? I’ll tell you what it won’t be, though. It won’t be being sacked. I have cleverly avoided that by not finding another job. I’m glad, really. It frees me up to go into more branches of Smiths and ask them to order my book. 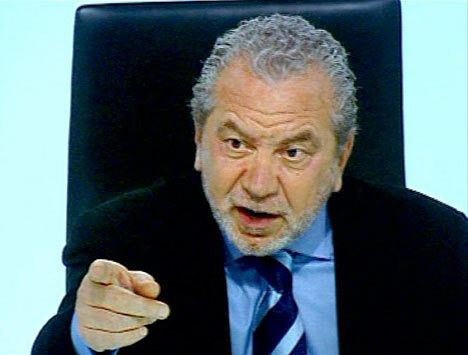 "I'll 'ave three copies, while yer at it"
I really enjoyed this & love the Alan Sugar picture - though sorry about being sacked - and congratulations on the novels. Ah, thanks Anne! How nice of you. You're right, madoc. I was offered redundancy as a kind of after-thought, but for reasons too complicated to go into here, I didn't take it. That's show biz, isn't it? I worked as a freelance editor for a children's book publisher for a while. One week I was told that I'd improved the standards of their text. (They were better known for their graphics than their text--and justifiably, on both counts. I think they were right--I had improved them.) A few weeks later I was sacked. No explanation. Craziness.